If David Ishii can work his way into the top 10, he will qualify for the next Champions event. Nobody will ever say that David Ishii plays golf at a brisk pace. If he were paired with Raymond Floyd or Lanny Wadkins, he might be walking off the ninth hole at the same time they exited the 18th. At the halfway point of yesterday's second round at the Turtle Bay Championship, Ishii and playing partners Jerry Pate and D.A. Weibring were warned they were out of position. Nobody was put on the clock because the second round was still going to finish on time, but by day's end, Ishii and Co. left the 17th green at the same time the group in front of them had completed their rounds. One Champions Tour rules official at the 17th green timed Weibring's second shot into the green. It should take about 40 seconds to address the ball in that situation. It took Weibring about 65 seconds. He did the same to Ishii as he attempted a 4-foot putt for par. It took Ishii 72 seconds, forcing Pate to catch the eye of the rules official. As Ishii putted, Pate put his hands on the side of his face in a sleeping position and then smiled as if to say Ishii needs to pick up the pace. But in the eyes of the Pearl Country Club pro, all three golfers played a similar style. "I hit the ball kind of poorly on the back nine," Ishii said. "The officials were telling us to catch up. After the 10th hole (where Ishii suffered a bogey), I just lost my rhythm and I didn't hit the ball very well after that. I was trying to hurry up. I had a good start and I wanted to come in under par on the back nine. "At the 10th hole they said we were out of position and I felt kind of rushed after that. After that (bogey) I didn't feel good the rest of the way. I was playing my normal pace of play. It all depends on the players you play with. When you have three pretty much same-speed players, you're going to fall behind a little bit. All of us are kind of take-your-time players. But we weren't very far behind." 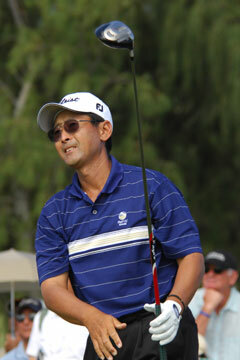 A rules official said Ishii was warned three times last year for slow play. The first fine is $500, the second is $1,000 and the third is $2,000. If a player is put on the clock 10 times in a year, he is automatically fined $20,000. Ishii opened with three birdies on the first five holes to put him in a tie for second early on. But once the group was told they needed to get back in position with the group in front of them, it forced Ishii out of his rhythm. He didn't have a birdie on the back nine, playing in 1-over 37. He shot a 2-under 70 for a two-day total of 6-under 138. He is tied for 12th entering the final 18 holes, some nine strokes off the pace set by first- and second-round leader Fred Funk. What Ishii needs to do is manage at least a top-10 finish. If he turns that trick, then he will be eligible to play in the next Champions Tour event in Florida automatically. "If I got in I would go," Ishii said. "The Florida swing is hard to get in. If you get a top 10 and get exempt, sure. I just want to shoot under par and see where that leaves me. I want to play good tomorrow. Today was an easy day. No wind, you just had to hit the ball in the fairways and not have very long second shots." Record-setting performance: Funk's 64 yesterday left him at 15-under 129 to beat the old 36-hole record at Turtle Bay of 12-under 132 set last year by defending champion Loren Roberts. The event record was set in 1991, when it was still played at Kaanapali, Maui. Jim Colbert shot a 13-under 127 at the Kaanapali Classic and wound up winning the tournament by two shots over Dale Douglass. "How many did I set the record by, three?" Funk asked. "That's good. Maybe I can continue to shoot like that (today)." Roberts will not defend his title today, unless he shoots something ridiculous. He is currently tied for 12th at 6-under 138, some nine strokes off the pace. He did manage his 19th consecutive round in the 60s dating back to a final-round 76 that he shot in August at the JELD-WEN Tradition. It was Roberts' fifth straight round in the 60s this year. Inside the numbers: Gary Player managed to match his age for the 14th time in his career with a 1-under 71 yesterday. The 71-year-old South African has done that three times this year already. Six of the 14 times in his career have been better than his age. The day's biggest moves on the leaderboard were turned in by Andy Bean (33 spots) and Eduardo Romero (30 spots). Bean shot a 7-under 65, a 10-shot swing from the 75 he opened with on Friday. Romero had a 6-under 66 to improve nine shots on his 3-over 75 in the first round. Funk and Vicente Fernandez had the best rounds of the day at 8-under 64. Funk has yet to have a bogey in 36 holes here. It was his lowest round since shooting a 63 at the 2005 Blue Angels Classic. The hardest hole was the par-3 fourth at 3.167 with five birdies, 58 pars, 13 bogeys and one double by John Harris. The easiest hole was the par-5 third with a scoring average of 4.628. There was one eagle by Wayne Levi, 32 birdies, 40 pars and five bogeys.